I’ve also written extensively about the many examples of musicians-who-also-make-fine-art – Bob Dylan, Joni Mitchell, Ringo Starr, Marilyn Manson, Jerry Garcia, Dean Torrence and others – whose works have been seen on covers for their own recordings (and in Torrence’s case, for many other musical acts after he’d stepped away from his own singing career). These multi-talented art makers could barely contain their creative output, so when they weren’t making music, they turned to painting, photography and other means of expressing themselves. Perhaps they felt “who better than me” when it came to thinking about who best would understand – and be able to translate into something visual – the essence of his/her music and how that might be offered up to record-buying fans. Perhaps less written about, but no less important, are the several instances of musicians turning to talented relatives to help create the style guides for their records’ packaging (and merch, stage designs, etc.). Examples of output from these familial pairings include Raymond Pettibon’s memorable covers for his brother Greg Ginn’s band Black Flag, designer Michael Carney’s album art for The Black Keys (featuring his brother Patrick on drums) and, in today’s featured case, the trippy graphics illustrator Carson Ellis contributed to her husband Colin Meloy’s band’s 2018 release – that being the Grammy-nominated and Making Vinyl Award-winning package for The Decemberists’ I’ll Be Your Girl, crafted under the direction of the team of Jeri Heiden and Glen Nakasako at Smog Design, Inc.. Whether due to genetics or simply the results of two talented individuals being drawn to each other via their art, the products of these pairings are often times the most-personal expressions of how records are packaged. I reached out to Jeri and Glen to ask them to share a bit about how this particular package came together and they were pleased to provide the details. After all, aren’t we music art fans all one big happy family…? Mike Goldstein, AlbumCoverHallofFame.com – Before I get you to share the details of this grand package with me and my readers, I’d like to find out a bit more about how you became involved with the project. Can you tell me how it was that you were first introduced to your clients and artistic cohorts on this project? Had you worked with them before? Jeri Heiden, SMOG Design – We’ve been working with The Decemberists since 2011’s The King Is Dead. We were introduced to the band through our friend, Autumn de Wilde*, who has worked with them extensively and photographed them for that release. The deluxe box for that record included a 72-page book featuring 250+ Polaroids shot by Autumn and illustrations by Carson Ellis. (Editor’s Note – the credit for Art Direction for that record was given to the band’s leader, Colin Meloy). Designing a hardcover photo book was a little outside of their wheelhouse — so we got the gig. It was a fruitful collaboration and, as a result, we would go on to design other albums and EP’s for them including We All Raise Our Voices to the Air, What A Terrible World, What A Beautiful World, and The Crane Wife – Deluxe 10 Year Anniversary Edition — as well as Illimat, a board game created by game designer Keith Baker that features Carson’s beautiful illustrations. Jeri H – We were fortunate, while working on projects for The Decemberists, to be able to hear the music in advance. This album really had a different sound — the band worked with a new producer named John Congleton and were shaking things up a bit – adding synths and exploring common interests, influenced by glam rock and new wave. 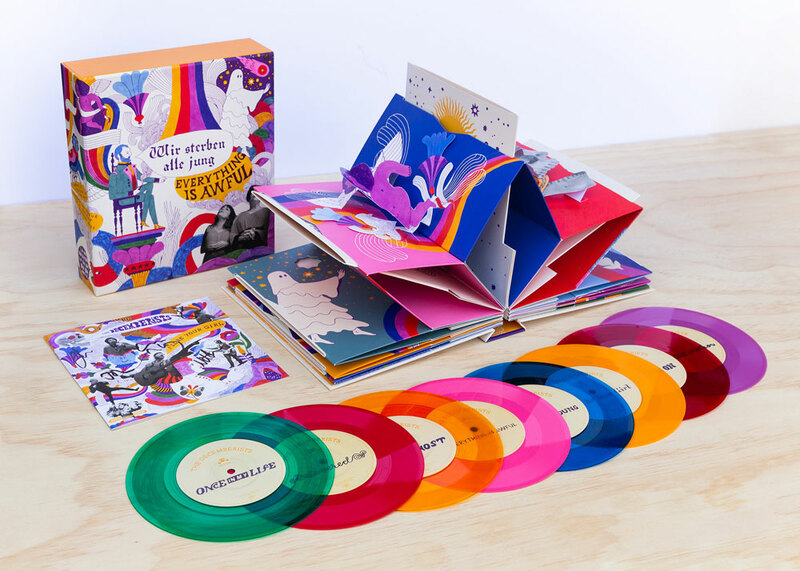 Colin Meloy called the album “an apocalyptic dance party.” Carson Ellis, Colin’s wife and illustrator-in-residence for the band, reflected those themes in her chaotic, colorful, and psychedelic collage. And, of course, she got a great shot at Trump in there! Glen Nakasako, SMOG Design – Carson’s art was an especially big influence. Combined with the music, the direction was so different than on their previous albums. It allowed us to be bolder in the steps we took. Mike G – So, I have to ask – knowing what the two of you knew about the people involved and your overall experience and knowledge of what “works “ for clients in the music business, what do you think it is that makes The Decemberists and the folks supporting them at Capitol Records different from other similar labels in their “category”? Was Capitol or the band known to have a particular approach to promoting and packaging music? 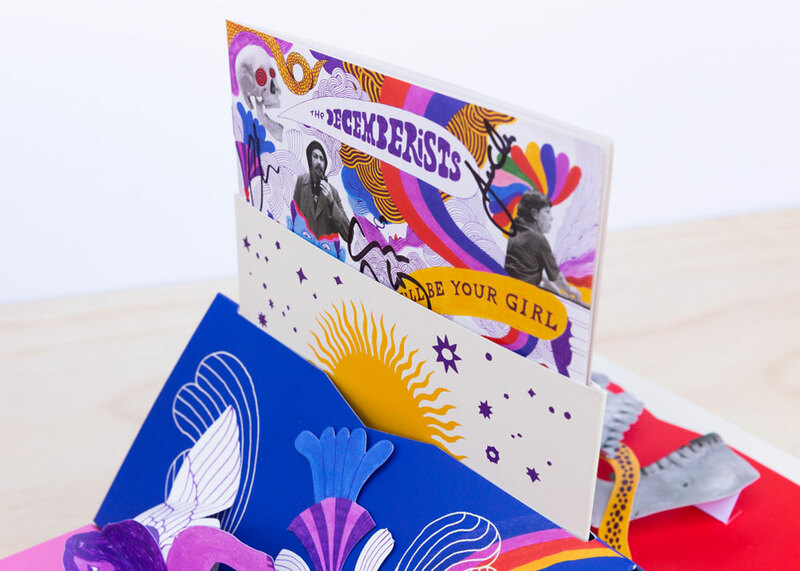 Jeri H – With a lot of artists and major labels, we beg for opportunities to explore special packaging, and the common refrain is “sorry, no time or money for that.” In this case, the band, label, and management are all very keen to deliver something special for The Decemberists’ fans. They plan ahead and put the concept of deluxe, limited-edition packaging on the FRONT burners. Capitol Records’ print vendor (JohnsByrne**) presented us with a unique concept for the deluxe 7” version. It was a pin-wheeling book and slipcase structure that could accommodate 7” singles in sleeves. It was just a white dummy — a blank slate with a lot of potential. Mike G – A job this big and complex looks like it would have required a larger-than-normal team of designers, graphic artists, package engineering gurus, etc., so how did you choose the talent who would work with you on this effort? Can you help me better understand the “who did what” on the project? Jeri H – The team consisted of the regular folks — Carson Ellis was the art director, illustrator and lettering artist – someone without whom there is nothing; Glen Nakasako, art director and designer here at SMOG, and myself serving as the creative director for our studio. The special packaging was supervised by several folks at Capitol Records in their creative, marketing and production departments, and the paper engineering and print production was handled by JohnsByrne. All together, there were about 9-10 people closely involved. Mike G – The production geek in me just has to ask – can you tell me whether any special tools or production methods were used and incorporated into your work processes and how those helped you create the finished product? Jeri H – No, we didn’t use any “special tools” other than good old fashioned hard work. There were many hours of drawing on Carson’s part, and then “finishing” the illustrations was very labor intensive. Carson used markers for the artwork instead of her usual gouache – it was faster than waiting for paint to dry! – but ended up not liking the texture of the markers. And so to come up with something that she was ultimately going to be happy with, Carson sent us hi-res scans of her artwork, and Glen would then finesse the colors, edges and overall textures in Photoshop. The photos were dropped into the final image composites. Lots of masking and re-configuring was necessary to rearrange the art elements for the deluxe package. Glen N – The construction of the package – with all of its many surfaces – was confusing to say the least. I initially had to make a rough physical mock-up that I could assemble and take apart to understand how all of the folds came together. At times, I got flashbacks of being confused in high school geometry class… I didn’t want the team to have to figure it out for themselves, so I would create 3-D visualizations of the package as the project progressed in order to show how everything fit together. Mike G – Sounds like a lot of work! So, thinking back on the job and taking into account all of the project-related production coordination, can you tell me approximately how long this job took – from start to finished product? Jeri H – The process took about 4 months from concept to completion. The standard album art was done first, and then the deluxe package. Mike G – Although I’ve already asked you to describe some of the inspirations and how you collaborated on the project, do you recall just how involved the artist/artist management/the record label was in the day-to-day development and review process of ultimately deciding what you should produce? Did they give you enough money and/or time to do what you wanted to do? Were they happy with the results? How did they express that to you? Jeri H – We worked very closely with Carson, Colin, management on the project. Our relationship is collaborative and we enjoy a mutual trust. The label is supportive of that collaboration. We’ll check in at appropriate intervals during the process with the various team members, to discuss progress and challenges, but there is no tug-of-war. When it comes to time and money — there is never quite enough of either! A few things had to be left on the table, like extra pop-up elements and die-cutting… but ultimately, everyone was happy with the outcome. High-fives all around. Glen N – Our day-to-day collaborative process was very open and casual. For example, if we found that some additional art would greatly help the design of a specific part of the package, we would just ask Carson if she could create something for it. And whenever I needed their opinion on anything specific, I could shoot it over to them and get instant feedback. Mike G – Since every project I’ve ever looked into seems to have something of an “a-ha” or “OMG” moment, I’d like to ask you if you’d care to share an anecdote or two – without betraying any confidences, of course…I’m sure that anything you’d be willing to share would be quite a treat for my readers! Jeri H – The only thing I can think of was when we realized that Carson had forgotten to add “bleed” to the illustrations – it was definitely an OMG moment. We always coordinate at the onset of a project, discussing project specs and the relevant opportunities and limitations within those specs. For the deluxe box we had many more surfaces to consider, so Carson provided additional line drawings for backgrounds, patterns and die-cut shapes, to help fill that space. Glen N – Yes, I did have to extend the edges of the front cover art which took an unexpected couple of days to complete. It didn’t help that I’m a perfectionist when it comes to the details! Mike G – Thanks for sharing and, in the end, it’s everyone’s satisfaction with the final product that counts. Suffice it to say, it is one that has impressed most everyone in the music packaging world, since it’s been nominated for a Grammy Award and has already won awards***. 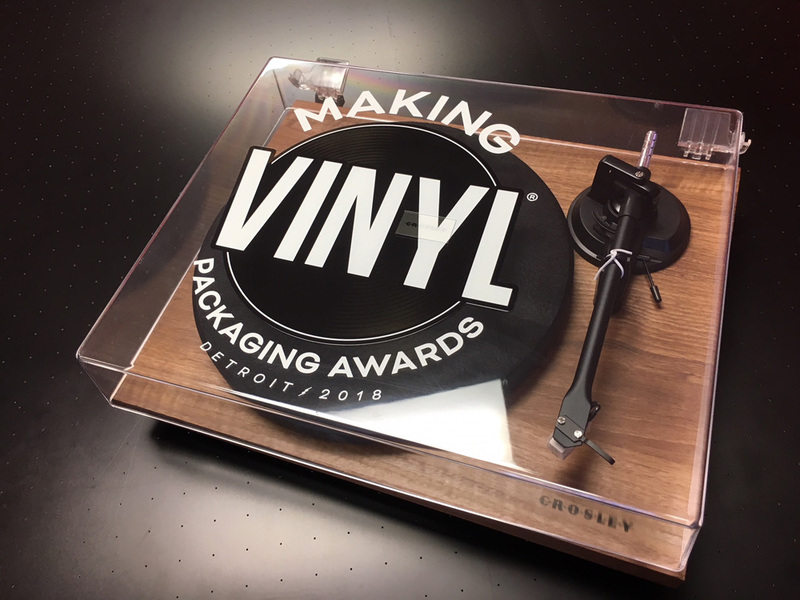 As a reformed gearhead, I was very impressed with the turntable-based award you were given at the recent Making Vinyl Awards. 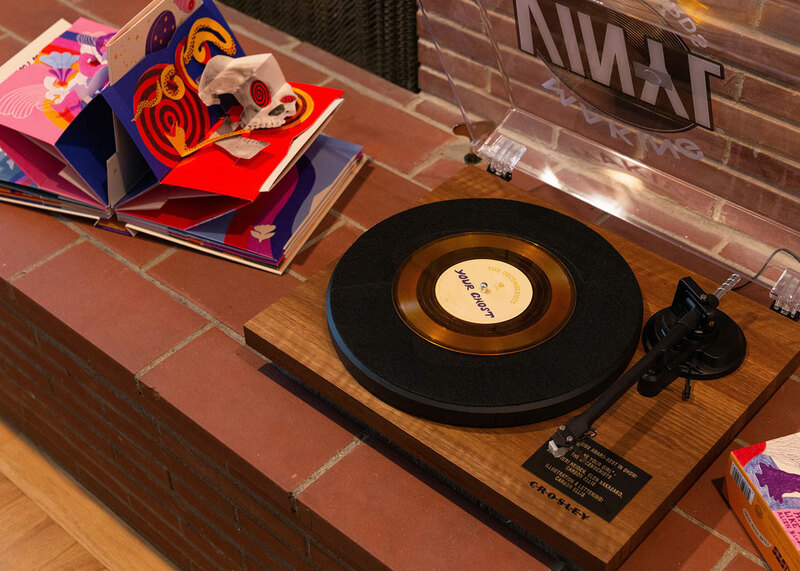 Did each of you get a turntable award? If not, who ended up with it and do you have a photo of it on display? Jeri H – There was only one turntable award. It has a fancy engraved plaque on it. Colin and Carson graciously donated it to team SMOG (see photo, below). *Autumn De Wilde is a photographer and video/film director who has a portfolio of successful work for clients in the music business. She’s the daughter of famed commercial photographer Jerry de Wilde, a protégé of Robert Frank who was a producer and photographer at the seminal Monterey Pop Festival in 1967. 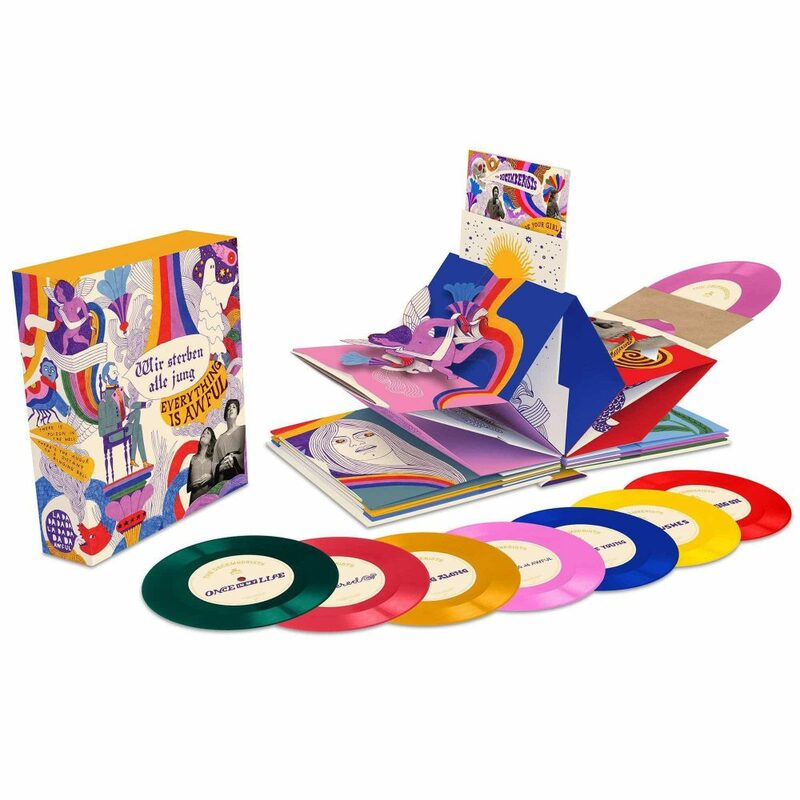 Product description – The I’ll Be Your Girl box set features eight 7” colored vinyl records containing sixteen songs – all eleven of the album’s tracks as well exclusive tracks captured during the record’s recording sessions. These records are packaged in a booklet featuring pop-up pages formed into a pinwheel, with a mechanism that bends and unfolds to present the vinyl records. Fans familiar with the code-hidden gems that are often included in video games will also be impressed with the number of die-cuts, pop-ups and other hidden treasures added to this package via laser-cutting and hand-gluing. Making the package all the more unique and valuable is the fact that the booklet is also hand-signed by the band! Jeri Heiden – Creative Director, SMOG Design, was inducted into “Art Director” category in the Album Cover Hall of Fame in 2016 and so her bio is available on the Album Cover Hall of Fame site (Please note that Carson Ellis was also inducted in the “Illustrator” category in 2018). Glen Nakasako – Art Director & Designer, SMOG Design, was born and raised in Pacific Grove, CA. His interest in design and computers emerged at a young age and, after moving to Southern California in 1991, he attended California Institute of the Arts, where he earning a Bachelor’s Degree in Fine Arts (and an appreciation for typography). After graduating, Glen remained in Los Angeles and freelanced for a number of years gaining experience from a wide range of work, including corporate branding and identity, packaging, movie posters, signage and textile design. He built his portfolio doing good work for clients such as Nike, The Getty Center, Disney and Maverick Records. In 2000, he landed permanently at SMOG Design, where he has been able to further expand his skills. At SMOG, where he applies “an absurd attention to detail” to all his work, Glen specializes in typography, logos and designs for books and other retail packaging. Glen has designed album packages for: k.d. lang, John Mayer, Christina Aguilera, Britney Spears, Janet Jackson, Neil Diamond and P!NK, among others. He’s been professionally recognized by the AIGA, Communication Arts, The Grammys® and Print. He has also lectured to students at various universities over the years, bringing his years of experience and insight into design to a new generation of students. When not designing, Glen can be spotted chauffeuring his dogs around town and developing a golden trucker’s tan. All images (except the previously-published Making Vinyl Award image) Copyright 2018-2019 SMOG Design, Inc and are used by permission to illustrate this article. All text Copyright 2019 Mike Goldstein/AlbumCoverHallofFame.com – All rights reserved. This entry was posted in Album Cover Artist Interviews and tagged ACHOF, album cover, album cover art, Album Cover Hall of Fame, article, award winner, best recording package, Glen Nakasano, Grammy, Grammy Award, interview, Jeri Heiden, Making Vinyl Awards, Mike Goldstein, packaging, record sleeve, SMOG Design, The Decemberists. Bookmark the permalink.